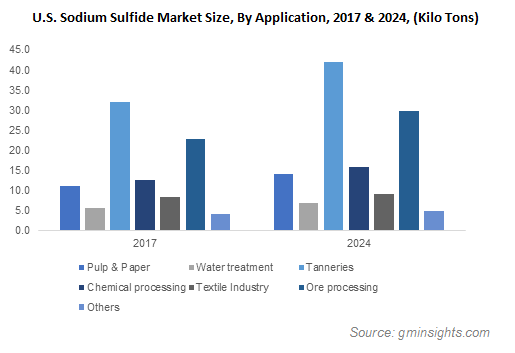 Sodium Sulfide Market size was over USD 415 million in 2017 and industry expects consumption at over 945 kilo tons by 2024. Rising operational costs and increasing stringent labor regulations in Germany, Italy, France and Belgium have shifted the leather production to several Asian nations including China, India, and South Korea. India has abundant raw material reserves with access to over 20% of the global cattle population and the labour-intensive leather industry provides employment to about 3 million poor citizens which may consolidate the tannery industry. Chinese leather exports exceeded USD 78 billion in 2017, which indicates ample growth potential for the sodium sulfide market. The product is used in leather processing for the dehairing purpose, which is a vital stage involving the removal of hair together with the epidermis, cementing substances, and non-collagenous proteins from animal skin. Low water availability, significant population rise, rapid city development and technological advancements in water treatment has led to an increasing necessity of water reuse. In 2017, the global demand for freshwater witnessed a rise of over 60 billion cubic meters annually which presents ample opportunities for water treatment. The product is routinely used in wastewater treatment for the removal of heavy metals ions such as mercury & lead that results in the formation of heavy metal sulfide particles over 2.5 µm in size, which can then be conveniently removed by sedimentation. Na2S emits toxic pollutants such as hydrogen sulfide gas through the dissociation process during downstream operations in the pulp & paper industry which may restrain market growth. Moreover, sulfide-rich effluents are commonly associated with ill-effects including sewer corrosion, malodours, and toxicity to humans, livestock & agriculture, which may further hamper market growth. Low ferric sodium sulfide market size surpassed USD 180 million in 2017. This product finds wide use in high-grade paper, medicine, leather, PPS plastic, dyeing and printing industries. Moreover, it offers various advantages such as high solubility in alcohol and water, which imparts a tendency to absorb atmospheric moisture and form a solution further stimulating sodium sulphide market growth. Anhydrous Na2S market should witness gains of over 6.5% by the end of 2024 owing to its wide use in gold ore hydrometallurgy, rayon dyeing, paper, leather and organic chemical manufacturing industries. Moreover, growing personal care applications for toenail trimming, in which the product performs a softening role for pain reduction may further stimulate market growth. 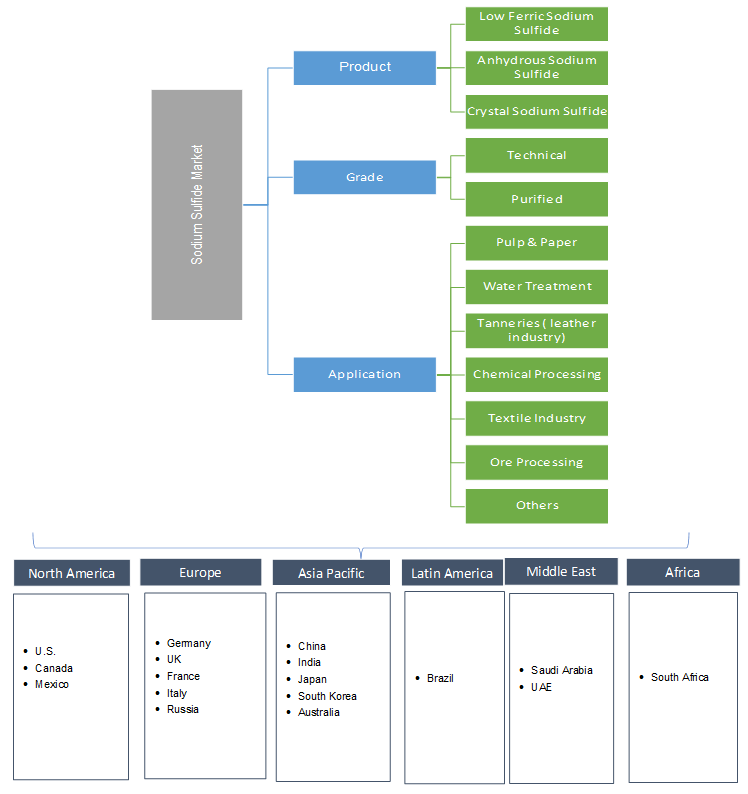 Technical grade sodium sulfide market surpassed USD 290 million in 2017 owing to the product’s vital role in dye, oil recovery, ore flotation, and detergent manufacture. Moreover, this product acts as an oxygen scavenging agent in water treatment, dechlorinating agent in tanneries, and as a textile bleaching agent & sulfonation agent in chemical manufacturing. Purified grade sodium sulfide market may witness gains of over 6.5% in the forecasted timeframe. This product is primarily used in the Kraft process in the paper and pulp industries but its high solubility in water compared to oxides and fluorides may increase product demand from the water treatment industry. Sodium sulfide market size from pulp & paper applications was valued over USD 45 million in 2017. Increasing demand for hygiene products, tissue papers and packaging may increase the requirement for paper pulp. For instance, Japan’s packaging market size exceeded USD 45 billion in 2017 which indicates ample growth opportunities. The pulp & paper industry converts wood into paper, cardboard & similar products with the aid of sodium sulphide, which may stimulate product demand. Sodium sulfide market size from tannery applications may witness gains of over 5% in the predicted timeframe. This product is used in the processing of different leather varieties which improves the softness and quality of the manufactured item. It also ensures the removal of other undesirable material such as non-collagenous proteins, epidermis and cementing substances from the skin which may further boost industry demand. Processing applications may exceed USD 150 million by 2024. This product ensures that the ore surface is free from products of hydrophilic oxidation which is vital for successful ore flotation. It finds usage in the processing of various types of ores such as chalcopyrite, molybdenite, silver, and chromite which may enhance sodium sulphide product demand. North America sodium sulfide market size led by the U.S., Canada and Mexico was valued at USD 110 million in 2017. The region is witnessing rising demand for ferrous metals such as iron & steel along with non-ferrous metals such as zinc, copper & lead which has stimulated ore processing market growth. The product protects the ore surface from hydrophilic oxidation, thereby promoting ore flotation which may further accentuate market growth. Europe sodium sulfide market size led by Germany, UK and France should witness gains of over 5% by 2024. This region has a strong leather processing industry which produces & exports various types of leather from livestock including calves, bovine, goat and sheep which caters to the garment, footwear and furniture markets. This product enables the softening of tough leather and plays a vital role in processing animal skin which may boost industry growth. Asia Pacific led by China, India and South Korea market size should reach USD 305 million by 2024. These countries face an increasing demand for designer leather bags, footwear, and accessories pertaining to rising disposable incomes, significant economic growth and population rise. This product breaks down cystine bonds in the keratin of animal hair cortexes, ensuring effective hair removal during leather production and increasing sodium sulphide industry demand. Sodium sulfide market share is highly consolidated and some of the major industry participants include Solvay, Longfu Group, Nafine Group International Co., Ltd., Sankyo Kasei, Hebei Xinji Chemical Group Co., Ltd., Shaanxi Fuhua Chemical Co., Ltd and Athiappa Chemicals. Prominent manufacturers are focusing on technological advancements to ensure product quality and expanding production capacity to allow steady supply to customers and achieve competitive advantage. Sodium sulfide (Na2S) is a hygroscopic yellow compound and a colorless water-soluble salt, which gives a strong alkaline solution. It is used in various applications including ore flotation, oil recovery, making dyes, detergents and leather processing. The growing leather industry segment for various products including commercial goods and consumer goods which further includes footwear, luggage, accessories, and belts may drive the market demand.